Embracing seasonal cooking requires effort. I try and — now that I think about it — manage to cook food that is in season a good portion of the year. But I know a lot of the fresh ingredients I use come from thousands of miles away. The other day I looked skeptically at some fresh Ahi tuna at the Co-op. The color was vibrant at any rate. I asked where it came from. Hawaii was the reply. The day before, my friend Rosamaria raved about tuna she found at Costco. I cannot bring myself to buy fresh tuna at Costco. It is a deep prejudice. As my friend Ida Glenn asks, how have we arrived at the point where we shop in stores so big we can’t see the door? Buying fresh fish at Costco seems to run counter to all the principles I’m striving valiently, if I say so myself, to adhere to. Where does tuna from Costco come from? Hawaii. I prefer to keep my battles, like my food, local. I am trying to stick to my commitment to select food that arrived on my table with the smallest amount of expended carbon. Talk about a losing battle! If the only way I can occasionally eat good, fresh tuna is to buy the tuna that comes from Hawaii, so be it. When it comes to vegetables and fruit, however, I stick to my guns. No blueberries from Chile. I frequent the farmers’ market to find the produce grown within a hundred miles of my house. By sticking to that resolve, I find that I eat more in tune with the seasons without making that the point of first regard. 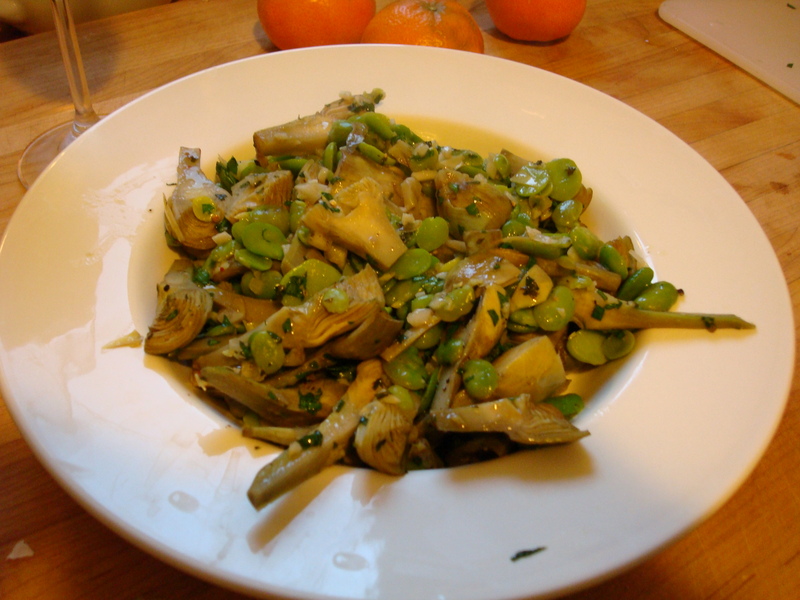 One dish, in particular, represents my determination to eat locally and within season: sautéed baby artichokes and fava beans. Baby artichokes offer a very small window of opportunity in the spring through which I dive as often as I can. Availability is all. As usual, I learned it from Gary. I think this is a New York Times recipe, but, to be honest, I’m not sure. After several springs now, I still don’t make it as well as he does. But it’s still pretty delicious — and involved in the making. This recipe takes prep work. It makes a good group activity. You can station one friend at the counter shelling the fresh fava beans. Another one can prepare the artichokes. Somebody else can chop the garlic. Then you need a master at the sauté pan. So, here goes. I’m reproducing this from memory. Preparing the fava beans is a two-step process. First, shell the long bean casings. Put them in a bowl. Bring a large pot of generously salted water to a boil. Add the favas to the water and blanch for at the most 2 mins, preferably less. Strain. When cool enough to handle, gently squeeze the inner vibrantly green bean out of its skin. Tedious and laborious, I know, but you’ll agree that it’s worth it. Put the favas in a bowl and set aside. Preparing the artichokes: Fill a bowl with cold water and squeeze a lemon into the water. rip off the loose outer leaves. Strip it down until you get to the pale yellowish-green center, where the leaves no longer come off at all easily. With a paring knife, cut off the very end of the stem and then trim the stem up to the choke in order to make it smooth. Put the artichoke on its side and chop off about half of the upper portion. Throw the top away. Take the paring knife and hollow out the middle of the choke. Slice the choke and stem down the middle. If it’s large, cut it into quarters. Put the cut pieces into the lemon water. Mince the garlic. Mince the parsley. Pour a slug of olive oil into a heavy skillet with a top. Don’t let the oil get too hot, because you want to sauté the garlic first. Sauté the garlic gently. In a minute or so. Drain the pared artichokes, shake them free of the water, and add to the garlic. Stir to make sure they are coated with the oil and garlic. Let them sauté for a few minutes. Sprinkle some salt over them and stir. Then reduce the heat and cover. It will take about 15 or 20 minutes for them to sauté and slightly steam. They should be tender to the bite. When they are tender, pour in the blanched fava beans and about half of the chopped parsley. Sauté for a minute or so. Sprinkle the rest of the parsley over it all. Salt and pepper to taste. Squeeze about half of the remaining lemon over the vegetables and transfer to a serving dish or serve up on individual plates. Eat immediately. I’m still trying to get the fava beans to maintain their intense green color. I believe it’s a matter of plenty of water, plenty of salt, and not over-blanching them. I promise you that the effort involved is worth it. And it’s a dish made all the more special by being possible only in spring, when baby artichokes appear in the markets. Every time I prepare this dish, I am reinforced in my resolve to eat seasonally. At least, for the most part.